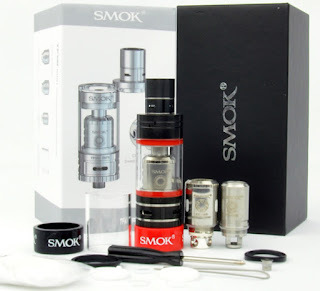 The smashing hit, SMOK TFV4 has officially been replaced by SMOK TFV4 Mini Tank in the vaping industry. Its smaller in size but fully loaded, has a 22 mm diameter which means it will fit nicely on majority of the mods. Mini Tank includes three new cores, TF-CLP2, TF-S6, TF-RCA and a Clapton Dual coil, which has a larger surface area in contact with the wick to give off more vapor for an amazing vaping experience. One of best features on the SMOK TFV4 Mini Tank is how the double layered drip tip has been improved to avoid scalding and not to for the top refill making filling easier and not drip. This Mini Tank is the best thing to have been introduced to the market. Now you can get the full vaping experience you've always been craving. This product is selling like hot cakes, so get in touch with us and order your Mini Kit today.